One of the easiest and tastiest side dishes to grace your table this season: Maple Roasted Delicata Squash. It’s caramelized to perfection and tossed in a sweet ginger maple dressing – perfect for squash season! I’ll be honest – this was the first time ever for me cooking delicata squash. I’ve been seeing it on everyone’s Instagram and blog recipes and finally broke down and bought a couple. It’s a squash that’s incredibly gorgeous, striped and brightly colored, so I really don’t know why I waited so long to try it – but now that I did, boy I’m definitely not going back! Popular for it’s soft, creamy texture and how sweet it becomes once roasted, delicata squash is also incredibly rich in nutrients. With 3/4 of your daily Vitamin A intake, high in fiber and iron, it’s a well-rounded squash that will make both your heart and your stomach happy. Today, I’m sharing a recipe for Maple Roasted Delicata Squash – a super simple way to cook up this seasonal favorite. For this Maple Roasted Delicata Squash recipe, you’ll only need your oven, a baking tray, and four ingredients and I promise you, the results are outstanding. 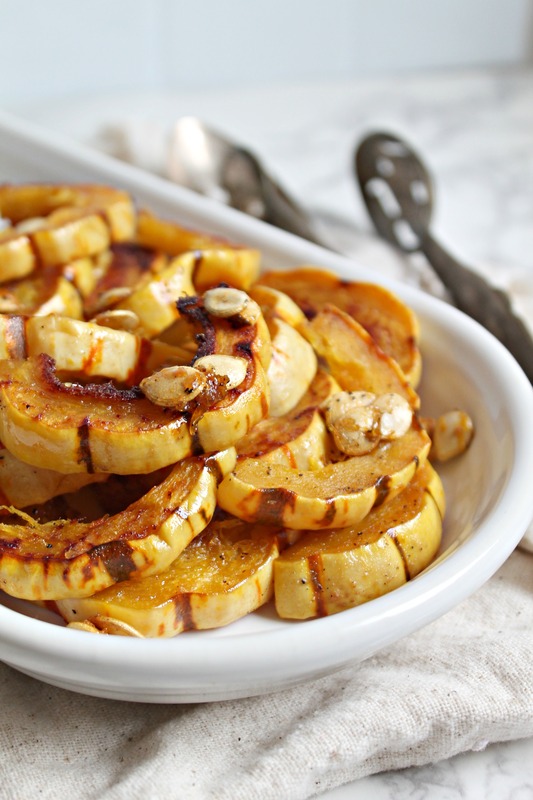 Just look at those bits and pieces of caramelized squash! The marinade it’s tossed in is basically olive oil, maple syrup, ground ginger, and seasoned with salt and pepper. FOUR ingredients and you’ve got a stellar side dish this season – go ahead and give it a try this week! Cut the delicata in half lengthwise and using a spoon, remove the seeds (you can save and roast them separately, they are delicious!). Cut the halves into slices and in a large bowl, whisk the maple syrup, olive oil, ginger, and season with salt and pepper. Toss the squash slices in this and place on non stick baking tray. Roast for 20-30 minutes until caramelized - serve warm or room temperature, these are as sweet as candy and the perfect side dish to a meal!